When editing a variation's code and hitting Save it only takes a second or two for the Save button to transform from Saving to Saved. But the actual time it takes for the save process to complete and for the changes to show on the page can sometimes take much longer than that. When I first started using Optimizely this lead to a lot of frustration and unnecessary work. There were instances where I was trying to fix something and since the "fix" didn't show on the page after I saved my work I assumed my code must be wrong. 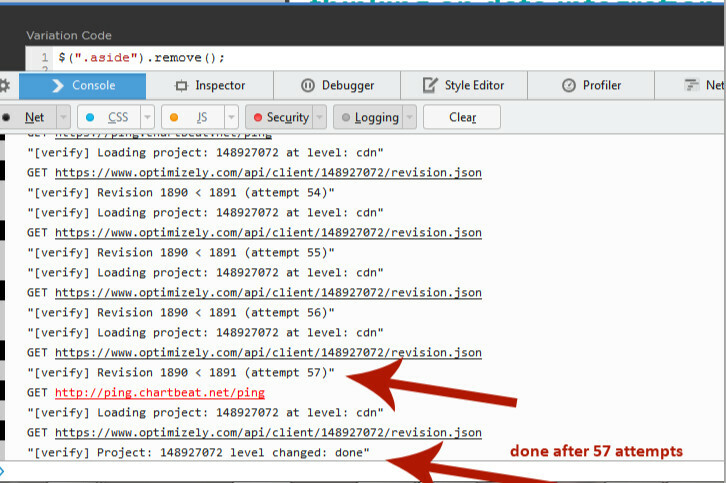 Later after working with Optimizely's awesome support team I learned how to check in the Console to see if an experiment had finished saving. But for new users this who don't know this trick it can be a frustrating and confusing experience. See the attached screenshot from just a moment ago where the experiment I saved required 57 attempts to complete the "saving" process even though the button indicated after only a second or two that the process had completed. So this suggestion isn't really about fixing the platform so that saves take less time. I understand that sometimes it may take time for the process to complete. The suggestion is to provide a more accurate visual indicator in or around the Save button so it's clear when the process has completed. As a side note, the fact that the biggest suggestion I have is around the timing of a Save interaction means that Optimizely is doing a thousand other things very well. Thanks for listening and keep up the great work. Thanks for the feedback, Brian. Just to clarify, if we were to create messaging within the editor that communicates when the variation is actually live on your site and/or when you can start viewing the variation with a force parameter, would this be helpful to you? Hi Amanda, sorry for the late response, I just noticed your question. Yes, messaging along those lines would definitely be helpful. Thanks! @Brian_DeLoach We launched a small messaging change to assist with this. Hey jlin, that's a great solution. Thanks! I have a small problem, please help me. I hit the save button, the project is saved, the next day I made some more changes and hit save button one more time, but then I checked it all in the preview mode, and do not like the result, want to get back to previous changes. I.e few days ago, few saves back? Is it possible to undo changes, to the previous saves? The button "undo" is not working. How often I need to click save button? Sometimes I need two days to complete the new version of experiment, what should I do?